What do you think of when you hear the word, “fall”? Back to school, golden leaves, or perhaps, pumpkin spice? For some people, the term vividly conjures up the memory of a sudden involuntary collapse, loss of balance, or rapid drop/descent without control. High-risk groups for falling include children and adolescents. Children become more prone to falling as they advance in mobility, curiosity, and independence. Fall hazards for adolescents often involve increased height and speed in relation to things such as trampolines, horses, skis, and bicycles. Males are most likely to suffer fatal falls, possibly due to risk-taking behaviors and occupational hazards. According to the National Council on Aging, falls are the leading cause of fatal and non-fatal injuries for older Americans; according to the National Institute on Aging, one in four people aged 65 and older fall each year. Additionally, one older adult is treated in an emergency department every 11 seconds due to falling, according to the US Center for Disease Control and Prevention. Although common, falling is not a normal part of aging. Most falls can be prevented and fall prevention education is key to identifying and reducing risk factors. Small changes can lead to big differences in reducing your risk of falling. Remove tripping hazards like cords and throw rugs. Wear non-skid shoes that fit securely around your heels. Address pain issues that limit your ability to react quickly. Report drowsiness or dizziness associated with new medications. Receive proper fitting for a cane or walker if consistently unsteady. Staying physically active with a program that is right for you. Focus on sitting and standing with tall posture. Practice balancing on one foot or with feet close together for one minute each day. Work toward standing from a sitting position without the use of your hands. Understand that limiting activity will NOT make you safer. If you do experience a fall, stay calm, remain still, and try to relax. Assess if you are hurt before moving. If you are able, get on your hands and knees, place hands on a sturdy chair or wall if available, slide one foot forward, and push to stand. Let your family and healthcare provider know if you experience a fall so preventative measures can be taken. Physical therapy may be recommended, where standardized tests would be performed to reveal deficit areas that could be addressed with an individualized exercise program. These programs may include stretching, strengthening, balance enhancement activities, and cues to improve your walking safety. 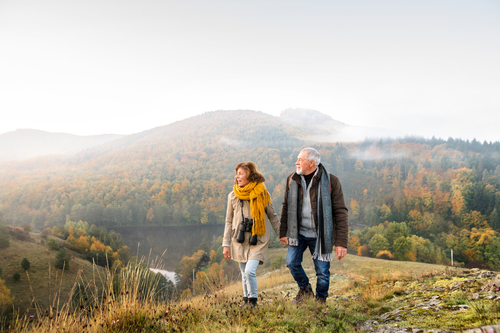 By practicing fall prevention, you can be free to think of “fall” as the time of year between summer and winter when the days become shorter and cooler. Stay safe, be strong, and enjoy a walk in the crunchy leaves.